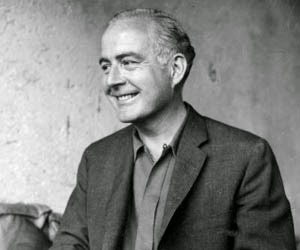 Samuel Barber was born in West Chester, Pennsylvania, on March 9, 1910, and died in New York on 23 January 23, 1981. The first performance of the Adagio for Strings took place in New York on November 5, 1938, with Arturo Toscanini conducting the N.B.C. Symphony Orchestra. The Adagio for Strings is scored first and second violins, violas, cellos, and double-basses. Approximate performance time is eight minutes. Samuel Barber’s Adagio for Strings is one of the most familiar and beloved pieces in American concert music. The work actually exists in three versions. Initially, it formed the second movement of the composer’s 1936 Quartet for Strings. The following year, Barber transcribed the work for string orchestra. In 1967, Samuel Barber once again made an arrangement of the Adagio, this time as an Agnus Dei, for a capella mixed chorus. Barber made his famous string orchestra transcription in response to a request from Arturo Toscanini. The immortal Italian maestro was seeking to perform new American orchestral works with his N.B.C. Symphony Orchestra. On November 5, 1938, Toscanini and the N.B.C. Symphony performed the world premiere of the Adagio for Strings, as well as Barber’s First Essay for Orchestra. This concert, broadcast nationwide, did much to raise the consciousness of American concert audiences about one of their most talented young composers. Wolfgang Amadeus Mozart was born in Salzburg, Austria, on January 27, 1756, and died in Vienna, Austria, on December 5, 1791. The Requiem is scored for solo soprano, alto, tenor and bass, mixed chorus, two basset horns (clarinets may replace basset horns), two bassoons, two trumpets, three trombones, timpani, organ and strings. Approximate performance time is fifty-five minutes. In the early summer of 1791, Mozart received a visit at his Vienna home from “an unknown messenger.” The individual, acting on behalf of another who wished to remain anonymous, requested Mozart to compose a Requiem Mass. According to Mozart’s early biographer, Franz Xaver Niemetschek, the messenger cautioned the composer not to try “to find out who had given the order, as it would assuredly be in vain.” A few months later, Mozart received another visit from the messenger, who “appeared like ghost,” and inquired about the status of the commission. As Mozart’s physical condition deteriorated, he desperately attempted to complete the Requiem. In fact, Mozart continued to work on the Requiem until almost the very moment of his death. The horrible irony of the situation was not lost upon the composer. On more than one occasion, Mozart remarked that he was writing his own Requiem. 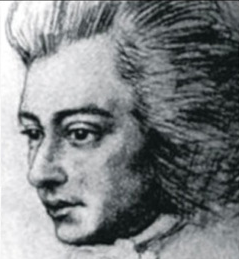 When Mozart died, just a few minutes before 1 a.m. on December 5, 1791, the Requiem was unfinished. Wolfgang Amadeus Mozart was 35 years old. Over time, much of the Requiem’s lore and mystery have been superseded by fact. For example, we now know that the “unknown messenger” was representing Count Franz Walsegg, a nobleman who resided in Lower Austria. Count Walsegg was an amateur musician who played both the flute and cello. One of the Count’s hobbies was to commission, anonymously, works by various prominent composers, and then try to pass the music off as his own. The Count’s wife died on February 14, 1791. It is quite possible that Walsegg commissioned the Requiem from Mozart with the intention of presenting it on the first anniversary of her passing. The image of Mozart—deathly ill, and racing against time to complete the Requiem—certainly makes for a compelling story. In the case of Peter Shaffer’s Amadeus (1979), it even makes for compelling theater. But in truth, during a considerable portion of the time Mozart was involved in the creation of the Requiem, he was in reasonably good health and spirits. However, by the middle or end of October, Mozart began to feel ill. Mozart was convinced that he had been poisoned. He told Constanze: “I know I must die…someone has given me acqua toffana and has calculated the precise time of my death—for which they have ordered a Requiem, it is for myself I am writing this.” Constanze, fearful that the Requiem was the cause of her husband’s morbid thoughts, convinced him to put the work aside. A few weeks later, Mozart told Constanze: “Yes I see I was ill to have had such an absurd idea of having taken poison, give me back the Requiem and I will go on with it.” But on November 20, Mozart became stricken with the illness (perhaps, rheumatic fever) that would kill him in a few weeks’ time. Constanze’s final conversation with her husband occurred when she tried to reassure Mozart that his physician had offered an optimistic diagnosis. Mozart responded: “It isn’t true. I shall die, now when I am able to take care of you and the children. Ah, now I will leave you unprovided for.” And with those words, Mozart died. After Mozart’s death, Constanze entrusted Joseph Eybler with the task of completing the Requiem. Eybler was a pupil of Johann Georg Albrechtsberger, and a composer Mozart esteemed as “a young musician of whom it is to be regretted only that so few are his equal.” Eybler began work on the Requiem, but ultimately found that he did not have sufficient time to devote to the project. Constanze then approached several other composers before deciding upon Süssmayr. Debate continues as to the specific contributions of Mozart and Süssmayr to the Requiem. But in any event, Süssmayr’s efforts allowed Constanze to receive the remainder of Count Walsegg’s commission fee. On December 14, 1793, Count Walsegg presented the Requiem in Wiener-Neustadt. The subsequent revelation of Mozart’s authorship of the work caused him no small embarrassment. By the very nature of its creation, Mozart’s Requiem has inspired considerable debate—not to mention several performing editions. And while it is fascinating to speculate on what Mozart might have accomplished with the Requiem had he been given more time on this earth, what remains is a work of haunting eloquence, beauty, and power. Perhaps it is only fitting that a sublime genius, taken far too soon, would bequeath as his valedictory statement a glorious work that, nonetheless, leaves us yearning for more.